Review posted November 20, 2018. Schwartz & Wade Books, New York, 2016. 36 pages. Baby Berry sat on Mama’s hip. “Make do,” he repeated. However, the family has plenty of chickens scratching around. Lula Mae seizes one and adopts it as her dog. Quickly, she shows that her dog Pookie is a good show dog, shepherd dog, and guard dog. Mama is not convinced, and Baby Berry continues to echo what she has to say. But when Baby Berry doesn’t repeat their words, they realize he has wandered off. Where could he be? When Pookie shows herself to be a good search-and-rescue dog, that’s when she wins over Mama. I usually resist the rejected-animal-heroically-saves-the-day trope, but this one comes in such a delightfully silly package. I think it may be Anne Wilsdorf’s illustrations that win me over. I so loved Sophie’s Squash, another story of a little girl making an unconventional adoption. Anne Wilsdorf knows how to draw precocious free thinkers like Sophie and Lula Mae. 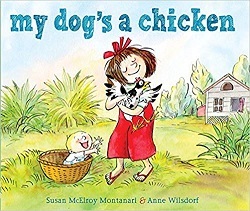 This book also has some fun repetitive elements that should work well in a story time. And the illustrator plays fair – if you look closely, you can discover where Baby Berry has gone while the rest of the family is frantically looking.